Makenna Roberts and her family are surrounded by the Law Enforcement team in blue and Medical team in red after a charity flag football game Saturday held at Stansbury High School. 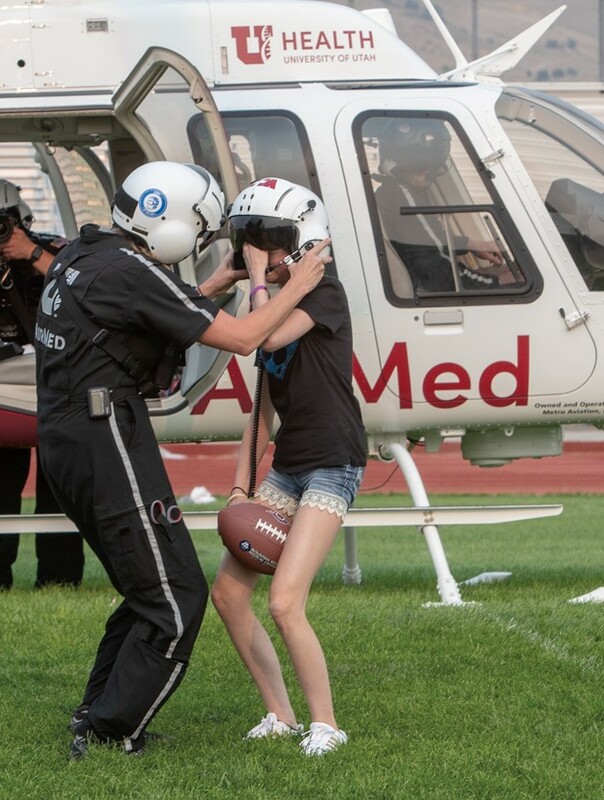 Makenna Roberts arrived by University of Utah AirMed helicopter to deliver the game ball at a charity flag football game on Saturday. 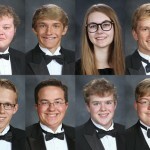 Roberts was diagnosed with a rare form of bone cancer and was the beneficiary of the fundraiser. AirMed staff help Roberts take off her helmet after the helicopter landed in the middle of the SHS football. The Law Enforcement team execute a play in Saturday’s game. Randi Thomas tries to outmaneuver the Medical team. Law Enforcement quarterback Coleton Roseborough throws over the Medical team’s defense. Makenna Roberts is greeted by her parents Shelli and Don Roberts after the 14-year-old arrived by helicopter at Saturday’s charity game to deliver the game ball. Makenna’s grandmother and Tooele Ciy Mayor Debbie Winn sang the National Anthem before the game. Mark Hayden signs a ball before handing it off to teammate Mindy Millet. The ball was presented to Makenna Roberts after the Tooele County 911 Super Bowl charity flag football game on Saturday. Event organizers are working to make the game an annual fundraiser. You can’t have a Super Bowl without a little spectacle. So it was fitting that the game ball for Saturday’s Tooele County 911 Super Bowl was delivered by a University of Utah AirMed helicopter — and the delivery was performed by a veritable rock star. 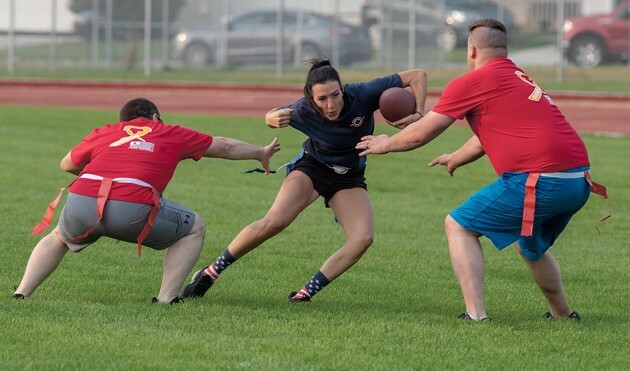 Makenna Roberts, 14, was the star of the show and the beneficiary of a new annual tradition — a charity flag football game between law enforcement and medical personnel. Makenna, who lives in Stansbury Park, was diagnosed with a rare form of bone cancer in March. 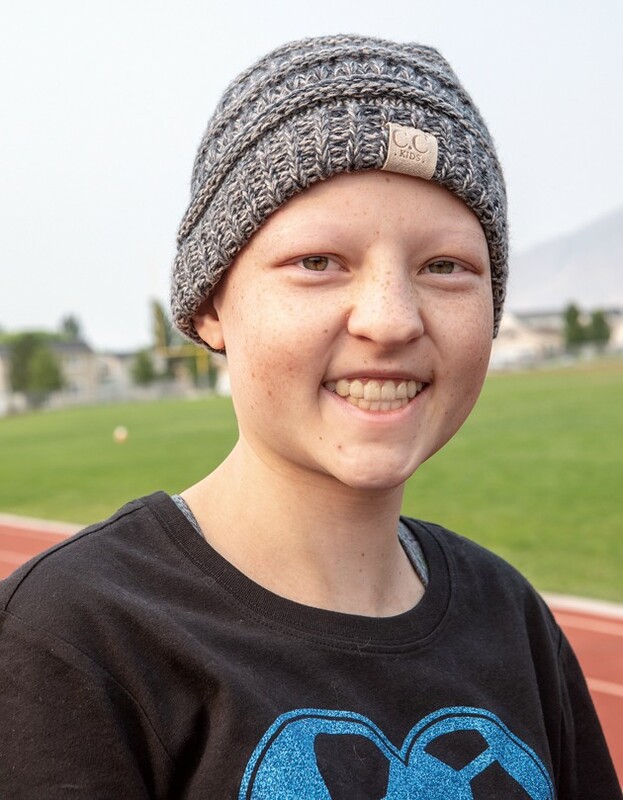 When Makenna disembarked the helicopter, which landed in the middle of the Stansbury High School football field, she was clutching the official game ball. She stopped for pictures with both teams prior to kickoff. On the sidelines, as the game began and the west bleachers neared capacity, Makenna cracked a smile. Her father, Don Roberts, said turnout for the first-time event, in the midst of the Stansbury Days festivities, was more than he expected. “It’s incredibly humbling,” he said. Makenna’s mother, Shelli Roberts, described the support from the community for her daughter and her family as incredible. Makenna was diagnosed with Ewing sarcoma on March 15, a date that sticks in the collective memories of the Roberts family. Ewing sarcoma is a rare form of bone cancer that is more common in teenagers and young adults, according to the Mayo Clinic. The disease most often occurs in the bones, but can also begin in soft tissue in the arms, legs or abdomen. Treatment for Ewing sarcoma follows the common pattern of many types of cancer, with rounds of chemotherapy and radiation. Shelli Roberts said Makenna is about halfway through radiation treatments but has another year of chemotherapy ahead. Makenna’s battle with cancer has affected the whole Roberts family and has put their priorities into perspective, Shelli Roberts said. With the adversity facing Makenna and her family, selecting the beneficiary of the first 911 Super Bowl wasn’t a difficult choice for Shelli Roberts’s co-workers at Mountain West Medical Center. 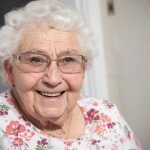 Event organizer and emergency room nurse Mardi Munn said the idea for the game came first, but both teams wanted to give back to the community. The idea for the game first came up during Tooele County’s high school graduations this spring, according to Munn. “So we really threw it together really fast,” she said. Despite how quickly the event came together, there was plenty to see and do throughout the evening. Debbie Winn, Tooele City mayor and Makenna’s grandmother, sang the national anthem. The Stansbury High School band performed throughout the game, as did cheerleaders from Tooele High and Stansbury High, and the Tooele High drill team. There were food trucks on site and a raffle with prizes including free skydiving, Utah Grizzlies tickets and a painting. 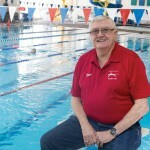 Like any first-time event, it didn’t start without a few hitches, though some were beyond the control of organizers. The dramatic helicopter entrance featuring Makenna, for instance, came about an hour after the game was supposed to kick off. 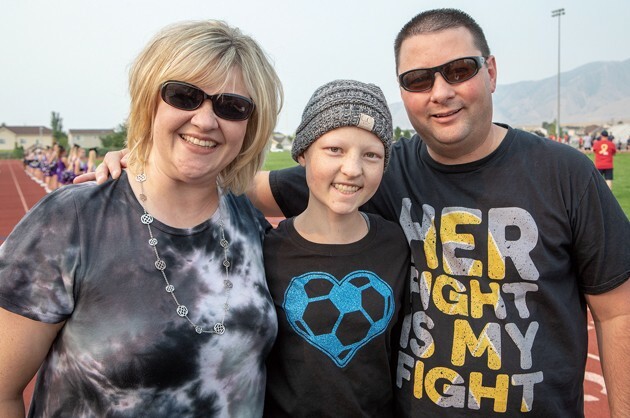 The Tooele-based medical helicopter had to respond to a call, so AirMed had to fly in another one from Bountiful to pick up Makenna and make it to the game. As a result of the late start, the game was shortened to 20 minute halves, down from the 30 minute halves that were originally planned. 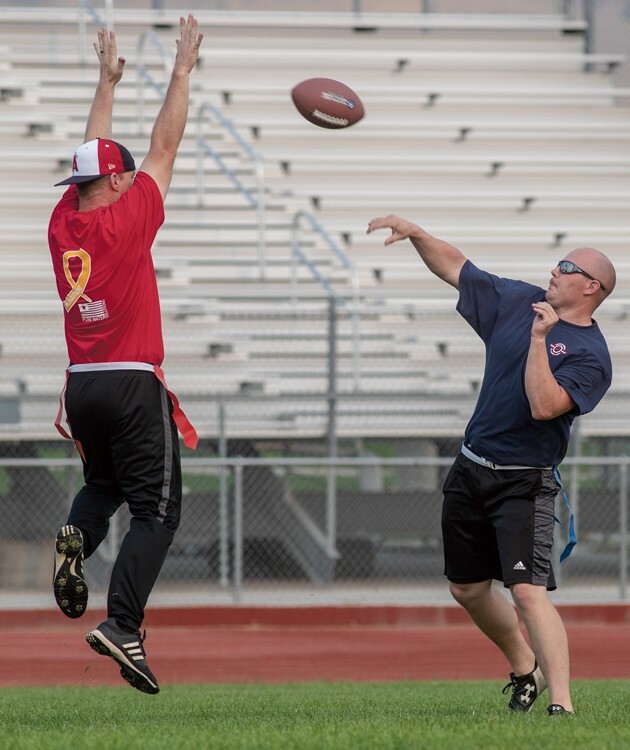 Despite the early hiccups, however, the Tooele County 911 Super Bowl rewarded the patient crowd with what they hoped — a football game and a couple hours of entertainment. On the field, the game was a defensive struggle, featuring numerous interceptions, including one returned for a touchdown. 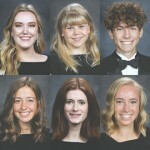 The law enforcement team featured representatives from Tooele City, Salt Lake City and West Valley City police departments, Tooele County Sheriff’s Office, and Utah Highway Patrol. 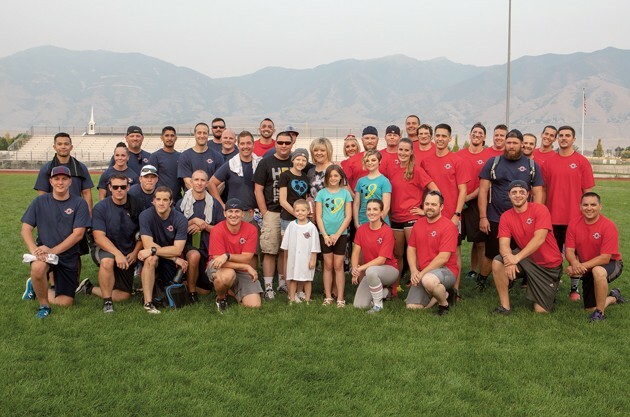 Players on the medical team represented AirMed, Mountain West Ambulance, Mountain West Medical Center staff, and Tooele Army Depot Fire Department. The refs for the game were Salt Lake City police officers, according to Munn. When the dust settled on the game, the medical team came away victorious, 13-0. Mountain West paramedic Mark Herrera said he expects the game, and experience surrounding it, to be even better next year. 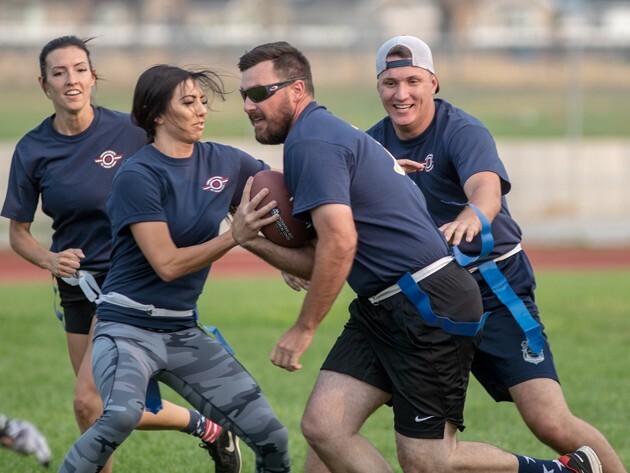 While the law enforcement team didn’t manage to win, Tooele City Police Detective Jason Spencer said it was fun to play a friendly game of flag football with people they work with. By the end of the game, the preliminary returns showed the game raised more than $3,000 for Makenna and her family. Munn said the goal is to make the Tooele County 911 Super Bowl an annual event, with a different individual, charity, or cause as the recipient.